She said yes! Have you recently purposed to your significant other? Do you have an engagement ring that is currently uninsured? Hopefully she didn’t say yes to the latter! Buying an engagement ring is an important step in life. No matter how big or small the ring, it should be considered priceless because of what it represents. That being said, priceless items are irreplaceable, but what would you do if the ring were lost or stolen? Many consider buying an engagement ring an investment as there is a good chance that it won’t lose any value. That is if it’s insured! How do you know how much insurance is needed if you don’t know how much the ring is worth? Most insurance companies will require a current appraisal to confirm that it is being insured for the cost to replace the ring if it were lost or stolen. Some jewelry stores will appraise your ring and present you with a certificate of its value. Keep a copy on file for your records. It should be noted that a thorough appraisal will include the 4 C’s: carat weight, color, cut, and clarity of the stones. If your center stone is approximately half a carat or larger, your jeweler should provide a diamond certificate from an independent laboratory such as Gemological Institute of America (GIA) to prove authenticity. It's not a good idea for an appraiser to inflate the cost of the ring, as the higher the value, the more your monthly premium will be. Also, there is a chance the insurance company may replace your ring instead of giving you the cash value if lost or stolen, which should discourage you from wanting to pay a higher premium for something that isn’t worth that value. It’s important to get your ring apprised every two to three years for insurance purposes. You may notice that the value of your ring continues to go up with every appraisal, this shows you that it was a good investment as it appreciates! When going to reappraise, bring a copy of your previous appraisal so they don’t have to start from scratch. This should also help you cut costs. Now that you have your appraisal, it is time to actually insure your ring, or any other valuable jewelry you may have. If you have a homeowners’ or renters’ insurance policy, you can purchase an extension, often referred to as a rider, that specifically extends the coverage limit for your jewelry. This is a popular option in part because it allows people to have all their insurance in one, rather than purchasing separate plan. It is very important to review the covered causes of loss with your agent. Every policy is different and you cannot assume that your ring is covered for EVERY loss. What happens if you just lose a stone or stones? Is there a deductible? Make sure you understand how the insurance will respond. Another option to insure your ring is to schedule it on a valuable articles or jewelry policy. This type of policy can work very well if you have several items that need to be insured or if the items change throughout the year. Typically, there is a lower deductible and broader coverage. Again, all policies are different and it is very important that you understand exactly what is covered. Ask your agent any questions you might have, so you are not surprised at the time of a claim. With both options, the cost to insure your ring will mainly depend on the replacement cost of the jewelry you are insuring and the city where you live. Different locations have different rates due to higher or lower theft rates, tax rates, and other factors. Just remember, price is only one factor, we buy insurance to protect us when things go wrong. Before you buy any insurance policy, ask questions and be informed. Congratulations on popping the question! 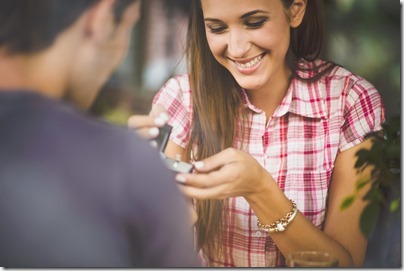 Now that you know how to properly insure your engagement ring, MHG can be the “go to” for all your insurance needs. Read our blog “What Newlyweds Need to Know About Life Insurance” to learn how to properly cover you and your spouse as you begin your lives together. If you are interested in purchasing life insurance, or have any questions, we’re here to help! MHG has the insurance specialists to assist you in attaining the best coverage for your budget. Please contact us today at 954 828 1819 or visit mhginsurance.com. Congratulations and cheers to many years of wedded bliss!